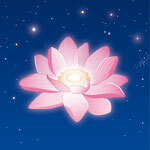 Lotus aligns you with your own starlight and helps you to bring your own divine light and guidance into your life. Lotus brings healing, transformation and liberation. It raises your vibration and penetrates all of your energy bodies aligning them with the divine light and your own heaven. Place the bottle between your feet for a moment. Slowly lead the essence in front of your body upwards till above the head. Apply one drop on each chakra (from lotus chakra to base chakra) and on both knees. Lead the essence along the spine (from bottom to top). Lead the essence clockwise with 10 – 20cm distance to the body around each chakra, starting with the brow chakra and finishing with the base chakra. Apply one drop on your feet (bridge of your feet) and one under your tongue.